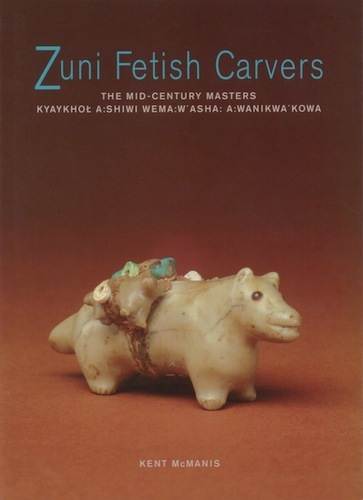 Published in conjunction with an exhibition organized for the museum by Kent McManis, this catalog features selections from the Wheelwright Museum’s superb collection of Zuni fetishes amassed by Leonora Scott Curtin, mostly between 1925 and the late 1940s. The museum’s holdings were augmented with selections from several private collections. The exhibited/illustrated pieces were made by the first generation of carvers at Zuni to create these wonderful small sculptures for the commercial market. Exhibited and published with the approval of the Zuni Tribal Council, the fetishes featured here include work by Theodore Kucate, Leekya Deyuse, Teddy Weahkee, Leo Poblano, David Tsikewa, and Morris Laahty.